Honey 8 month old, a pure-bred beautiful golden Labrador. She didn't have a great start - she was found as a stray when very tiny a kind lady kept her until she was 7 months old, but could not keep her we helped the lady and fostered Honey until she was rehomed. 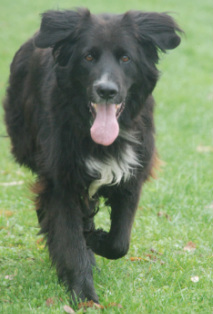 Tao approximately 11 years old came from Refuge Canin Lotois. His owner died and the family could not look after him so he ended up in refuge through no fault of his own. Now he has been rehomed very close to Cozy Cats and Dogs so we are lucky enough to see him regularly. 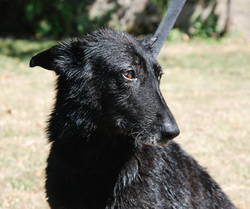 Popy now renamed Brian was found as a stray and ended up in SPA Mornac Refuge. His lucky day was when a group walk was arranged by a local volunteer. Myself and Jane from Phoenix Association walked Popy with a number of other dogs and we noticed he was in badly need of a hair cut. Well cutting a long story short he came home with us so we could find him a family. 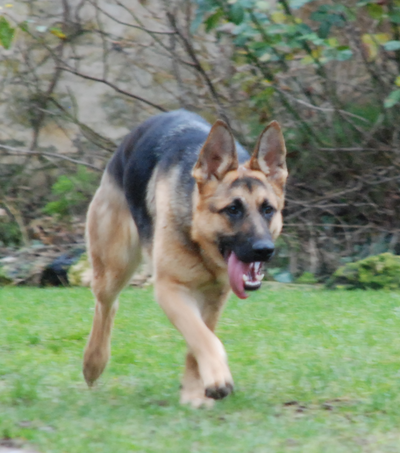 Now Brian is in a loving home..
We spotted Jack on the Dog Links site and with myself and Phill being German Shepherd enthusiasts we were keen to find him a forever home. Very soon he found his new family. Robbie wasn’t faring so well at the SPA Bergerac. 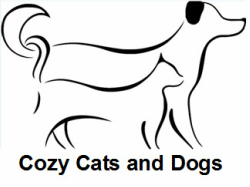 We couldn’t have that, so he began his recovery in a Phoenix foster home, AKA Cozy Cats & Dogs. This sweet little chap was a lost soul, bewildered to be in a cage, surrounded by big barking dogs. He is now in a stable forever home where he can regain his confidence and blossom. His tail started to wag on day one of being at Phoenix and a happy, affectionate boy has emerged! Kizzy's owner sadly died and one of her wishes to myself and Phill was that we would help Kizzy find a good home. We soon found that special place that Kizzy deserved and she now lives with two other yorkies. We are so happy she now has the perfect new home. Fina was transported to us from Los Infiernos Murcia in Spain by a group of volunteers who were very concerned about her wellbeing. Fina had a litter of puppies at the refuge which were rehomed and so she was left behind. She is just the sweetest girl you could ever imagine even though let down and beaten by humans. 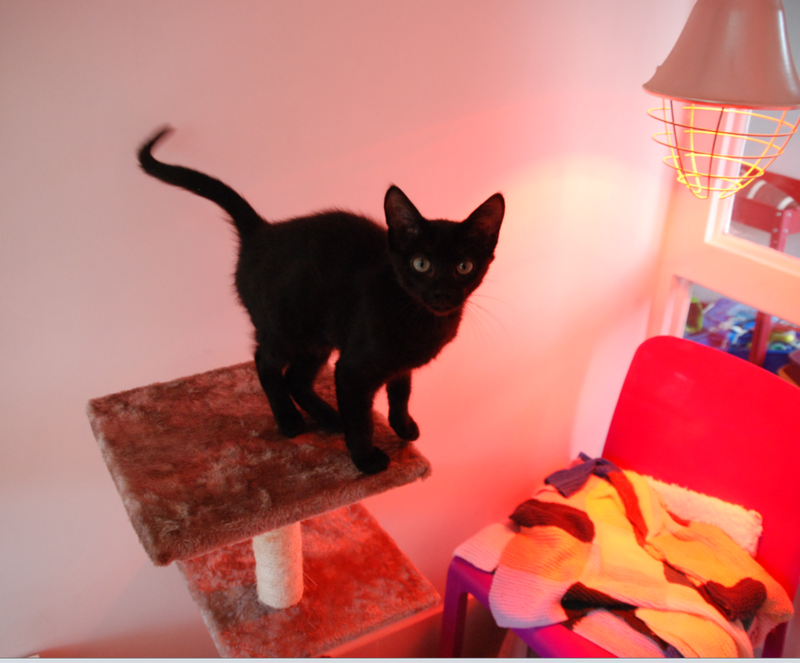 Now living with a loving family and Cookie, her fellow play mate. Pako came from SPA Mornac refuge and wasn't faring well, he was under weight and harming his own tail due to circling in his kennel. Phill and I collected him to foster and within six days he went to his forever home. Now renamed Pablo. December 2014 Rehomed: Taro 4 months old Kitten adopted from Phoenix Association, now in a loving home. February 2015 This is 6 months old Jupitar whom was saved from being put to sleep as he has hip dysplasia. The vet contacted Association Orfee and they raised the funds to operate on Jupitar. He stayed here at Cozy Cats and Dogs for his post op rest and we found him a loving forever home. Rehomed July 2015: Azor had been in Mornac SPA Refuge for the last 10 months, with much advertisement we managed to find him a loving family to retire with..
August 2016: Hayko we helped rehome this boy via L'espoir des lovely boy. August 2016: Siam came into us for fostering with her 3x kittens only 2.5 weeks old, just a few hours later SPA Mornac telephoned us as they had 7x kittens found in a plastic bag hanging from a tree abandoned only 2x days old, they asked if we could take 3x of them for Siam to feed which she did happily. Siam was lucky to be adopted from one of our customers who saw her at our cattery and fell in love with her. August 2016: First two of Siam's kittens adopted by another of our customers together names are Marble and Mottle now living with two older cats. August 2016: Magnolia from Siam's litter adopted and will be staying with us until October when she can live with her owner. February 2017: Our foster boy Freud via the Phoenix Association in his new home renamed Ruben. Nov 2018: Blaireau's elderly owner had to go into a home. Blaireau is now with a new family and enjoying his new life.